Late night visit on a Tuesday in mid October after being at a party locally. 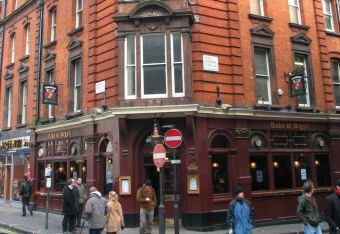 This was my first ever visit to this traditional corner plot Samuel Smith’s pub right in the heart of Soho. Even though it was late it was still pretty busy. As expected the bar had the full range of Sam Smith’s ales on and the Sovereign bitter was in very good form. The interior looks fairly untouched with stained glass panels and mirrors and a mosaic floor running up to the bar. I’d like to say I will visit again but with so many pubs on my “tick” list who knows if I ever will. Very old fashioned pub with a strange but tasty beer selection. It's not huge and is pretty much one room with very high ceilings with some kind of classical design. For me, it was borderline too old looking that it looked a bit unclean but it was a pleasant place to drink just on the edge of rampant and somewhat sleazy Soho. It is cosy and I can imagine it being a nice place to be during a cold winter's day in London. Only real down side was the barman served us a glass of white wine when we asked for Rose. But it was still a nice glass of wine either way, and we were too polite to complain! Standard Sammy Smith's pub...enjoyed a couple of pints of Old Brewery Bitter post work. Very busy pub but service was prompt and professional. I love this pub, the staff are always friendly, I would reccomend this pub to everyone who likes a relaxed friendly atmosphere. Bonus feature FIT aussie barman.